People always ask us what we do with our free time in the winter, with tourist season over I think they imagine us spending our days sitting by the fire, reading books, and sipping coffee. Well, not to say that we don’t occasionally get to indulge in those wonderful activities, but I find there is less “free time” than I thought there would be. First off, you are a slave to weather, if it snows you shovel, (want to go the bathroom, shovel a path to the outhouse!) if the wind blows, you shovel the drifts, if it warms and the snow starts melting you shovel slush and fix trails. Then, there is getting firewood. 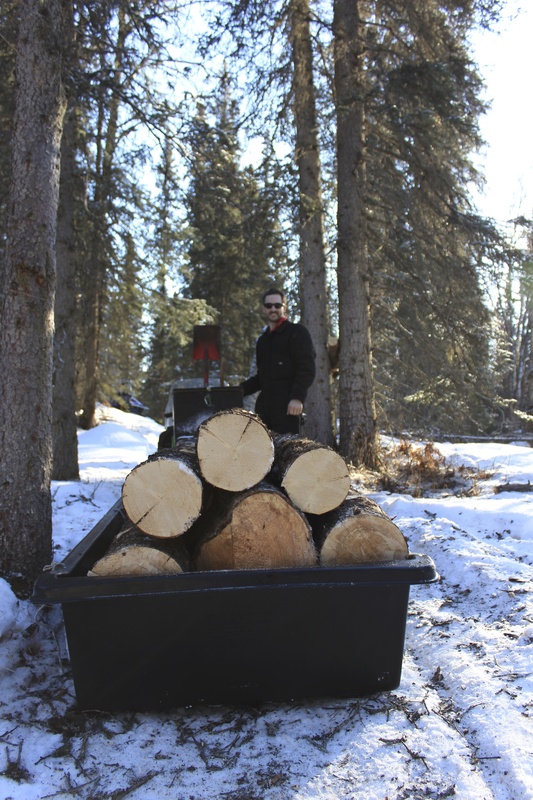 This has always been one of my favorite activities, I have a lot of good memories of getting firewood with my dad. 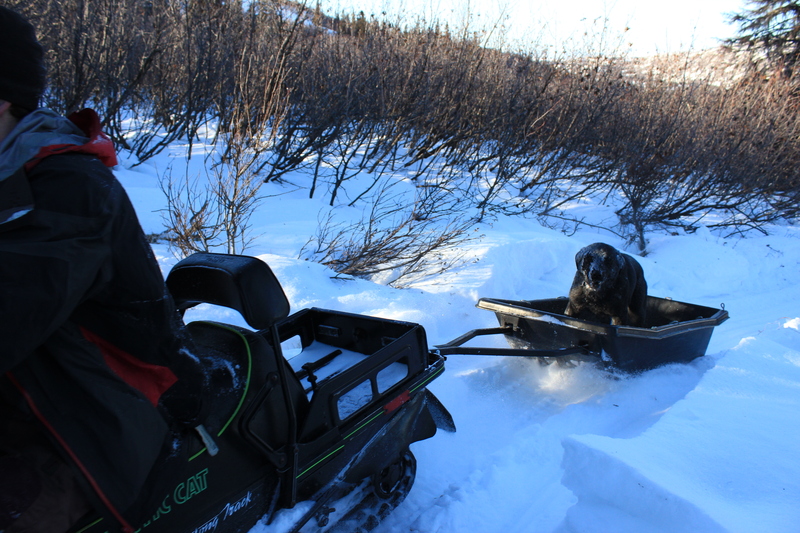 Its a little more fun out here, mainly because we go out with the snow machines, pulling sleds. 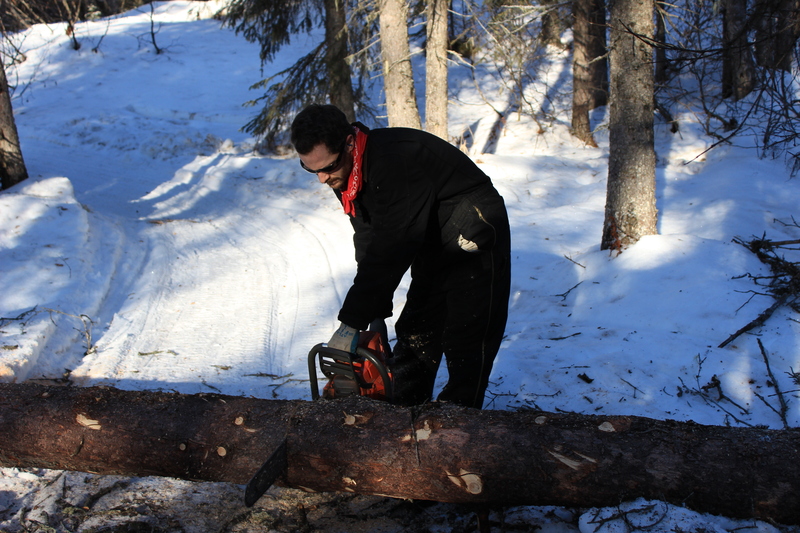 I am finally learning how to use a chain saw! 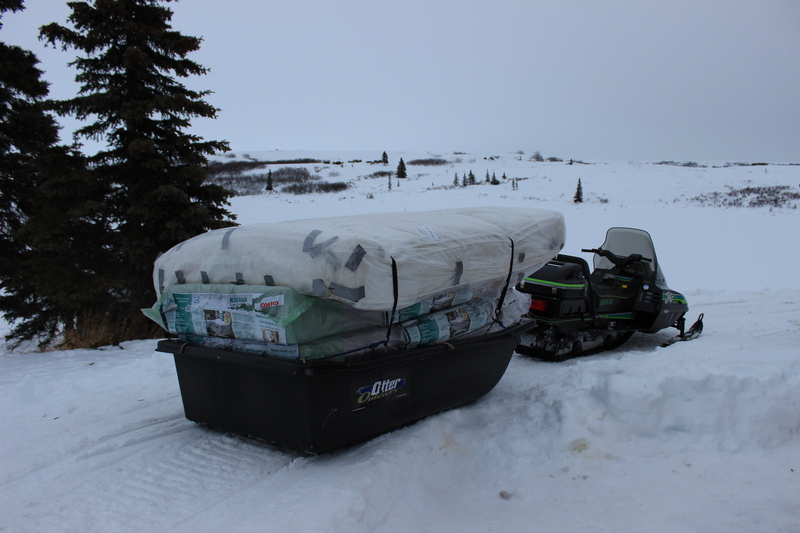 Also, winter is one of the best times to haul supplies in and out. 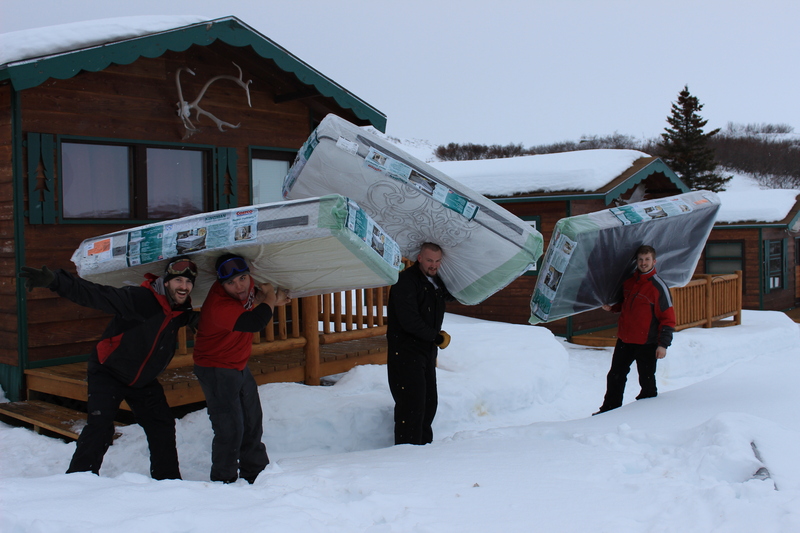 Recently, we got all the new mattresses for the cabins hauled into the lodge. We had a great crew of friends and family that helped out. Joe and I have spent a lot of days on the trail the last month, between supplies and visitors, but we are so thankful to have both. Winter being our slow time for guests, also means its the time to repair and spruce things up for tourist season. When I sit down to make a list of what needs done for the day, I find there is always more than I can complete in one day. The most surprising thing of all about winter, I am always sore. Winter has made me use muscles I didn’t know I possessed. 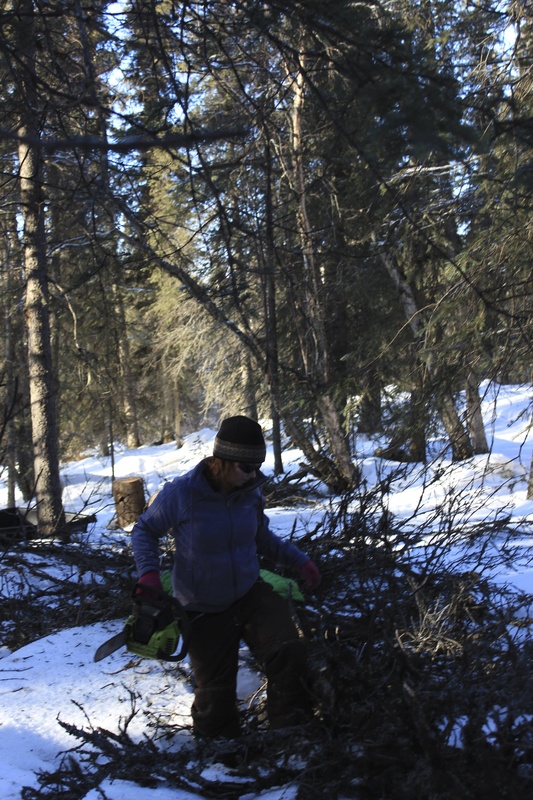 My left arm is sore from using the chains saw, my right arm is sore from using the axe, my neck and shoulders are sore from snowmaching on a rough trail, my back aches from shoveling, and my ribs, who knows why they are sore. This may sound like a pity party, but in truth, I love it, because I know with each new ache and pain, I am getting a little stronger. At the end of the day, when I crawl into bed, my mind and body tired, I know its been a good and productive day. Now, in case you start to think winter is some kind of hellish nightmare for us out here, let me just say, in spite of all the work, we do get to enjoy some down time. Some days when the winds howls outside, we get lost in one of our favorite activities. 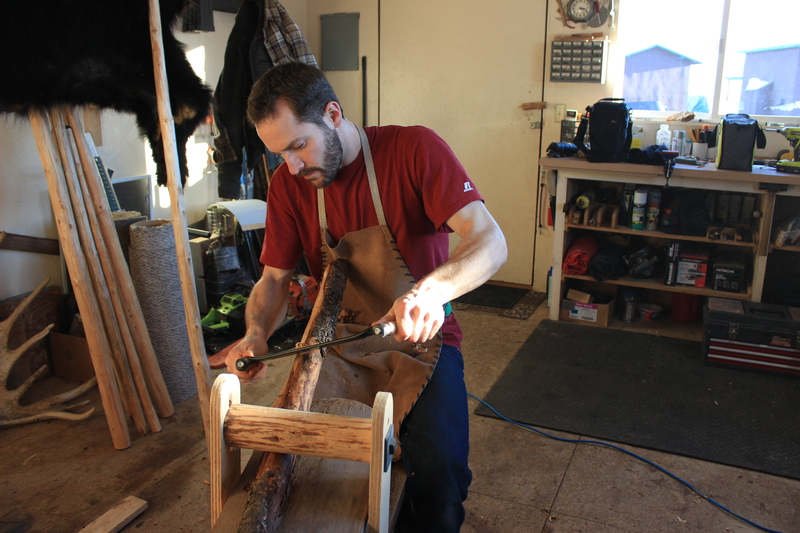 For Joe, it is working with wood in his shop. I used to say I wouldn’t see him all day if he didn’t have to come in from his shop for food, but here recently I noticed he took a candy jar out to his shop for snacks, so maybe I won’t see him at all! Anything Joe does, he perfects. 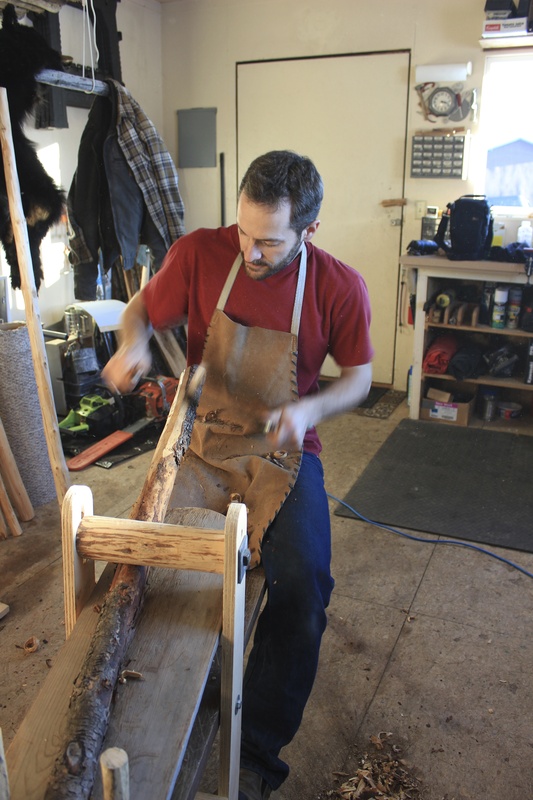 He even sewed himself a leather apron for his wood shop. The other day he came in and informed me it needed pockets for his pencils, and he spent the evening sewing them. I am always amazed at his ability to design and create things, and his persistence in perfection. 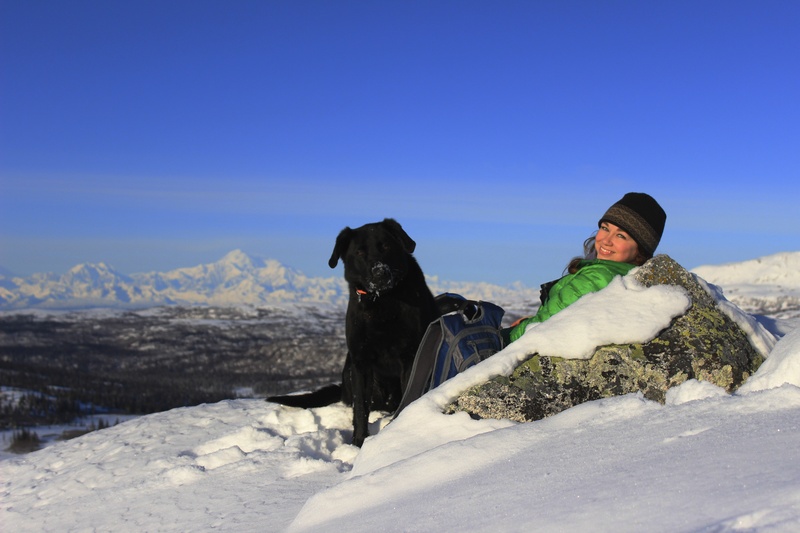 In my free time I am a little less practical and resourceful, I love to ramble with my dog on my snowshoes, soaking in the outdoors. I sit and scribble down my thoughts or get lost in a good book. I also love to make messes in the kitchen, trying out new recipes. As for Howie, he spends his abundant free time playing with sticks and bumming rides off people. 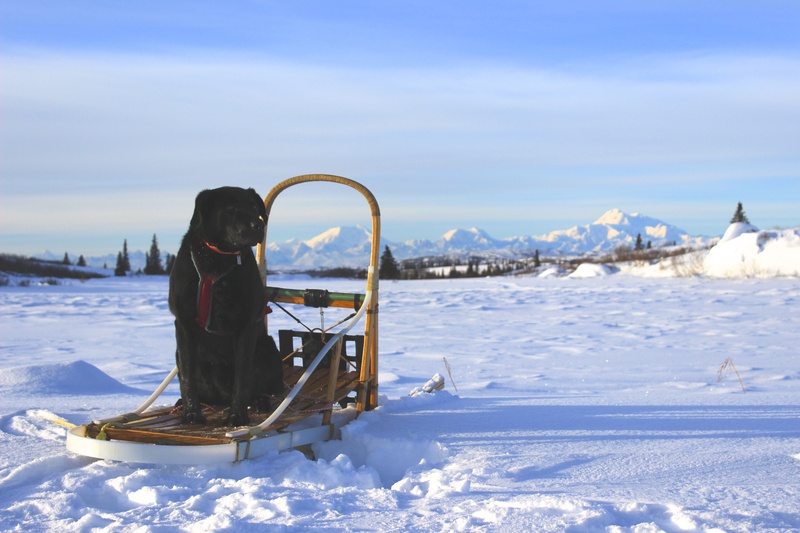 Occasionally, he does his job and lets us know about the coyotes across the lake or that there is a snow machiner on the horizon, but mostly he hunts for sunny spots to nap or someone to scratch his belly. 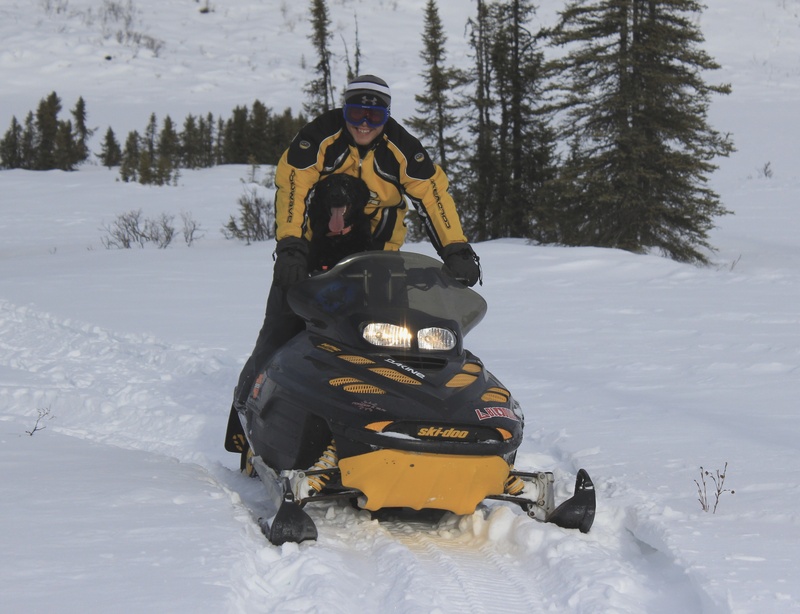 Howie would rather ride than run, even if he gets a face full of snow. Howie scammed a ride from his new best friend, Jake. Even got to ride in the front seat! Not sure which one is happier. Winter is passing quickly, the sun stretching a little higher each day, the birds have been singing in the bushes as if it were already spring. With each extra moment of daylight, we find another chore that can be completed before the sun goes down. We have several little benches where guest can sit and soak in the view. Cabins and the path down to the lake. Our curious neighbor, Hermin the Ermine. He tried to move in under Howie’s dog house, and was quickly evicted by Howie. We still see him around stealing scraps of meat wherever he can find them. Howie gorging himself on blueberries. Moose coming up from the lake. We went out to look and see if we could spot any bears out and about.... no bears but we enjoyed the sunshine! A beautiful start to the day, a pink sunrise and drinking coffee while Emma plays. Phil and Chester are two guys on the wrong side of forty who create a weekly comedy podcast with all sorts of interesting guests. Also available on iTunes!! !